Books make the best gifts. And books in a series are even better because once you find a good thing, it’s always great to have more. Here are some book series we’ve enjoyed as a family. Some of these books would fall in the non-fiction category and some are just good fiction that upholds the good and lovely. Christian Heroes Then and Now are a great way to introduce your readers to great Christian heroes of the past. We’ve enjoyed a number of these books. I’ve been slowly adding to our collection for a few years. You can buy these as gift sets or pick and chose individual books. We bought the Lightkeepers Boys Box Set: Ten Boys for my oldest boy a number of years ago for his birthday. He enjoyed the short stories that introduce each character and then learning more in depth about each one. There is also a Lightkeepers Girls Box Set. After my son read all the boy biographies, he asked for the girl set, too, so don’t think that the Ten Girl set is just for girls, or the other way around. The Daughters of Faith series is unique because it covers the childhood of famous women who made a difference while they were still young. These captivating biographies will inspire your girls to realize that they can make a difference for good even when they are still young. My boys enjoyed these, so I wish that the author would do a series on boys, too! The first set covers the lives of Phillis Wheatley, Harriet Tubman, Eliza Shirley (a young girl who pioneered the work of the Salvation Army in the United States), and Olive Oatman and her sisters (who were captured by Indians and found grace to live amid their captors). There is also a second set in the series. We love this set! These are some of my favorite books for young people. In them, young Ivan lives out his faith in communist Russia. It’s hard to find these books as a set, but they are available individually on Amazon. This book will build your children’s faith and make them thankful for the freedoms they have to worship God. Books in the series include Ivan and the Moscow Circus, Ivan and the Daring Escape, Ivan and the Informer, Ivan and the Hidden Bible, Ivan and the Secret in the Suitcase, and Ivan and the American Journey. Sherlock Jones and the Assassination Plot is the first book in a series of mysteries starring young Jasper Jones and his friend Penny Gordon. These books are from a Christian worldview. If your child loves mystery books, I highly recommend these. Related stories include Sherlock Jones: The Phantom Airplane, Sherlock Jones: The Willoughby Bank Robbery, and Sherlock Jones: The Missing Diamond. This is another great mystery series. I love this set! (I know I keep saying this.) One of the great things about it is that your child can get clues to the mysteries by looking up Bible passages. Unlike the Encyclopedia Brown books, which are sometimes based on obscure facts that almost nobody knows, if you take the time to look up the clues found at the end of these mini-mysteries, you can usually solve the mystery. My children have really enjoyed these. You can buy the books individually on Amazon or as a series here. The Freedom Seekers Series is the story of a family who seeks to help runaway slaves as part of the Underground Railroad. We loved this series. Your child will learn about an important time in history and also learn about courage in the face of danger. The Viking Quest Series is about a young girl, Bree, who is kidnapped, along with her brother, by Viking raiders. Through her many adventures, she learns where true forgiveness can be found. They are written by the same author as the Freedom Seekers. If you’re looking for Missionary biographies for your younger children, check out Little Lights. These five beautifully illustrated hardback books give lessons from the lives of famous Christians from the past – Amy Carmichael, Hudson Taylor, Corrie ten Boom, George Muller and Helen Roseveare. If you enjoy this set, there is a second set available. Billy and Blaze is a series about a boy and his horse. Though not necessarily Christian books, they are sweet old-fashioned stories. These are great to read aloud to younger kids or for kids to read themselves if they have a pretty good grasp on reading. Some great series here! 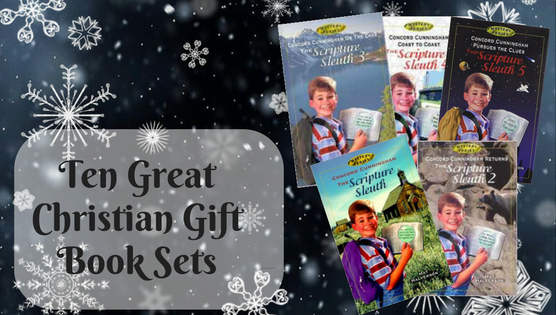 My kids especially enjoyed the Scripture Sleuth books. They are a lot of fun, aren’t they!? I’ve seen some of these, but some were new to me. We love the YWAM biographies here! Thank you for linking up with Literacy Musings Monday!